In my previous post, I explored how leading financial services (FS) organizations are harnessing the power of artificial intelligence (AI) and intelligent automation to boost revenue, reduce costs and increase efficiency across the enterprise. In this post, I’ll discuss how cloud and DevOps can do the same. Insurers in North America are changing the way they use cloud—and cloud is emerging as an important business asset. In Europe, insurers are also starting to see the benefits of cloud computing outweigh the challenges. The cloud is transforming the way businesses take advantage of technology to innovate. Companies that increase speed to business outcomes and innovate continuously will prevail. Reduce large capital expenditures associated with the implementation of in-house, proprietary solutions. Companies are using the cloud to scale up rapidly without enormous capital investments. Cloud computing services help insurers foster a high level of flexibility and standardization across multiple geographies. Insurance IT spending is still stagnant in many companies. 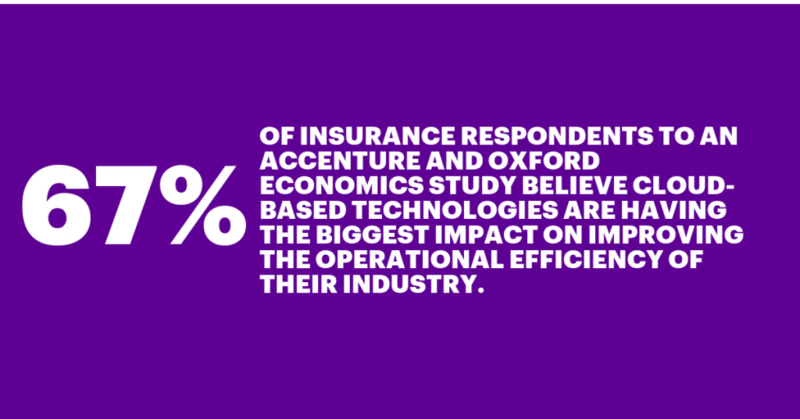 Therefore, many insurance executives are looking for options that can help them achieve their cost-cutting objectives. Trōv Offers household insurance with a smart repository of customers’ possessions through a cloud-hosted online digital locker. CoverWallet Provides a concierge-like service for small businesses, giving them access to advice, quotes and policy management tools online or over the phone. The Insurer Cloud A Microsoft Corporation, cloud-based ‘route-to-market’ solution for insurance product creation and lifecycle product management for any class of P&C / general insurance business. Versicherix Switzerland’s first peer-to-peer insurance—the technical side of the platform is open, letting investors, reinsurers and customers freely enter the system. FitSense Insurance Services Working to price risk for insurance across age groups and gender. FitSense uses fitness tracking wearables and its mobile app to gather and collate users’ activity data. Lemonade This peer-to-peer insurer, originally focused on renters and homeowner insurance, is now pursuing a broader regulatory approval strategy after starting small. DevOps, a leading software engineering trend, brings business, development and operation teams together to streamline IT and apply more automated processes. Over the last 10 years, DevOps has enabled the shift in application delivery from large-scale, project-based system implementations and follow-on maintenance to a continuous evolution of applications. Reduce time to market by up to 50 percent through streamlined software delivery. Boost team productivity and deliver new functionality faster. Identify quality concerns early through automated scans and a “you build it, you own it” mindset and reduce defects across the lifecycle by up to 30 percent. Make your operational state more stable and secure and your changes systematically auditable. Through a program to industrialize delivery, a European retailer saved over $300 000 in build and deployment efforts, as well as $1 million in testing efforts. Accenture’s DevOps services provided tooling design, support, automated environment creation and ongoing environment support to deliver new applications in a multi-release, multi-production environment project. We helped industrialize delivery from the outset using continuous integration, automatic test environment creation, automated testing and automated quality gates. An Asian telecommunications company created a new delivery model for Siebel, Java and TIBCO development based on agile and DevOps principles. Lifecycle automation, and organizational and process changes, significantly reduced effort and led to faster speed to market for application releases.